In the summer of 2010, the release of Romantic Warriors – A Progressive Music Saga took the music scene by surprise, putting a semi-official seal on the much-touted renaissance of progressive rock in the early 21st century. Retracing the origins of the genre while detailing its development in more recent times, the documentary’s no-frills style and unabashed sincerity captured the attention of viewers beyond the usual circles of prog stalwarts. However, Adele Schmidt and José Zegarra Holder did not rest long on their laurels, and, a mere few months after the film’s release, they were already busy working on a follow-up – this time dedicated to the Rock in Opposition movement, a subset of progressive rock with unique characteristics and a devoted following. In spite of the common misconception that attaches a political meaning to the “opposition” part of the name, the RIO movement was one of the first attempts by a group of bands to break free of the shackles imposed by major record labels and distribution companies and take matters into their own hands. In a way, the five bands that initiated the short-lived, though hugely influential movement (Henry Cow, Univers Zéro, Etron Fou Leloublan, Stormy Six and Samla Mammas Manna, hailing from five different European countries) were forerunners of the current endeavours of non-mainstream bands and artists. For two solid years, Adele and José worked unceasingly at the second installment of a planned series of documentary films on the progressive rock scene, travelling from their home in the Washington DC metro area to Europe and other parts of the US to meet the protagonists of the original RIO movement and those who have followed in their footsteps. Romantic Warriors II relies on interviews and concert footage (both archival and recent) for the bulk of the narration, though with the addition of elements that had not been fully exploited the first time around. Roland Millman’s judiciously used voice-over lends narrative cohesion to a storyline that might have otherwise come across as somewhat rambling. While in the first Romantic Warriors both authors remained constantly behind the camera, this time the viewer can catch glimpses of José in a few scenes – either behind the wheel, or interacting with the artists. Most of the interviews were conducted on location, though the filmmakers also made use of modern technology by using Skype to conduct video interviews with some of the movement’s main actors. 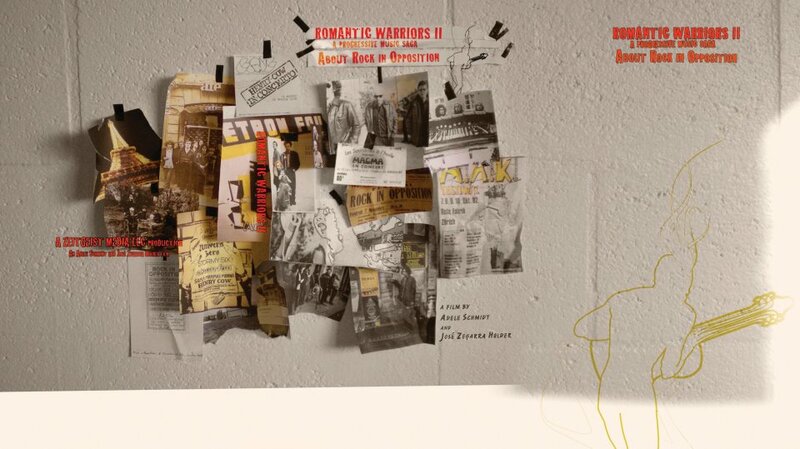 Romantic Warriors II retraces the history of Rock in Opposition, from its inception in 1978 – when the original progressive rock movement was already on the wane – to its demise and long-lasting legacy. The original protagonists of the scene and their heirs take turns in the spotlight, offering not just a historical perspective, but also a lesson on how the artists can take control by implementing various forms of collaboration. As was also the case with the first Romantic Warriors, the film is as much about the social and historical aspect of the movement and its ramifications as about the music itself – making it more approachable for outsiders. A very interesting mention of the cross-fertilization between the post-RIO bands and the post-punk scene in the early Eighties drives another nail in the coffin of the commonly held myth of the irreconcilable enmity between punk and progressive rock. For all the undeniable similarities to the first film, both in concept and format, Romantic Warriors II represents a quantum leap in terms of quality. The slightly gritty, warts-and-all approach of the original has been replaced by a more polished brand of realism that, while retaining its objectivity, also leaves room for artistry. The location shots, while often stunning, avoid the pitfalls of a tourist-brochure effect – whether it is a starkly beautiful view of the Rocky Mountains – a very apt visual complement to Thinking Plague’s music – or bustling views of London or Paris (including a breathtaking shot of the Tour Eiffel at night). Those “travelogue” scenes lend a coherent “road-movie” feel to the whole, and also emphasize the quintessentially cosmopolitan nature of the RIO movement. The use of concert-related ephemera (posters, tickets and newspaper clippings) and vintage photos brings the story to life and anchors it to reality. On the other hand, the striking fantasy sequence in which a cloaked and masked figure moves through the medieval alleys of Prague’s Old Town as a visual embodiment of Univers Zéro’s iconic “Jack the Ripper” adds a touch of weirdness and drama to the basically matter-of-fact fabric of the narration. Not surprisingly, the film features a very broad cast of characters, ranging from the main actors of the original RIO movement to those who have been carrying the torch up to the present day – fans included. Those who are familiar with the first Romantic Warriors will recognize some familiar faces, such as Steve Feigenbaum of Cuneiform Records and Paul Sears of The Muffins. Of the many musicians that appear in the film, Henry Cow’s drummer Chris Cutler (who will be present at the Washington DC premiere of the film, on September 28, 2012) is the one who gets the longest time in the spotlight, his testimony providing almost a running commentary to the development of the story – augmented by each of the other contributions until all the pieces of the mosaic fall into place. Thinking Plague’s Mike Johnson’s musings about the sorry state of Planet Earth (with the endless vistas of the Rocky Mountains as a backdrop) add new layers of meaning to the “opposition” part of the movement’s name, anchoring its present developments to some of the most urgent concerns of contemporary society. The last word, however, is left for Magma’s charismatic Christian Vander – an artist who, while never part of the RIO movement, almost embodies the definition of “groundbreaking”. His final quote, reminding the viewer that “something is always possible, even in the worst circumstances”, conveys a strongly inspirational message to anyone who believes in what they do. Festival and concerts play as large a role as in the original Romantic Warriors. The historic joint performance of Belgian outfits Univers Zéro, Présent and Aranis at the 2011 edition of the Rock in Opposition festival sets the scene, right before the opening credits; the once-in-a-lifetime event, named “Once Upon a Time in Belgium”, also gets ample coverage towards the end of the documentary. The film includes footage from the equally historic performances of Magma and Univers Zéro at the 2010 edition of the Sonic Circuits Festival, as well as scenes from 2011’s CuneiFest at the Orion Studios. The “new guard” of the Avant-Progressive scene is represented by an international cast of bands from both Europe and America. While the first Romantic Warriors may have been chiefly conceived for the benefit of the prog audience, the second episode of Adele Schmidt and José Zegarra Holder’s progressive rock saga holds a much wider appeal. The music’s very combination of the arty, the quirky and the academically austere will attract people who appreciate forms of non-mainstream music that do not necessarily fall under the “progressive rock” umbrella – including modern classical. The amount of care and attention that have gone into the making of this documentary is also reflected in the DVD’s stylish, scrapbook-like cover photo. Regardless of the intrinsically niche nature of the music, Romantic Warriors II is an outstanding piece of filmmaking in its own right, with the potential to kindle the interest of any lover of the tenth Muse.